What will you do if ICE shows up to your classroom or office? Our students need your help. With the possible repeal of DACA (Deferred Action for Childhood Arrivals), our students are increasingly under threat. Come learn how you can support them! 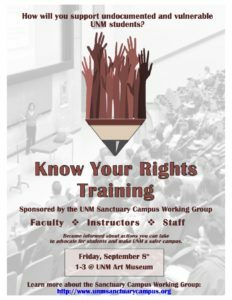 The Sanctuary Campus Working Group is hosting an important KNOW YOUR RIGHTS training for faculty, staff, and instructors on September 8, 1:00-3:00 at the UNM Art Museum. We will learn about our rights and resources so that we can better advocate for our most vulnerable students. Faculty, instructors, and staff across the campus can mobilize a culture shift so that all students, regardless of immigration status, feel safe on campus. After the training, continue our efforts to create a safer campus and to advocate for our students by joining the Sanctuary Campus Working Group. Add your name to our mailing list and join our community of campus advocates here! UNM Faculty & Instructors stand in solidarity with undocumented students & community members by pushing to make UNM a Sanctuary Campus. If you would like to receive updates from UNM Sanctuary Campus and events and information, please follow complete this form with your information.